Anonymous; Edward Elgar; George Frederick Handel; Gustav Holst; Henry Purcell; Hubert Parry; Jeremiah Clarke; John Goss;... Very Good. In very good packaging. 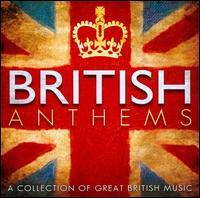 British Anthems. Anonymous; Edward Elgar; George Frederick Handel; Gustav Holst; Henry Purcell; Hubert Parry; Jeremiah Clarke; John Goss;... New.